Place stable and wide bench or platform at the knee level. 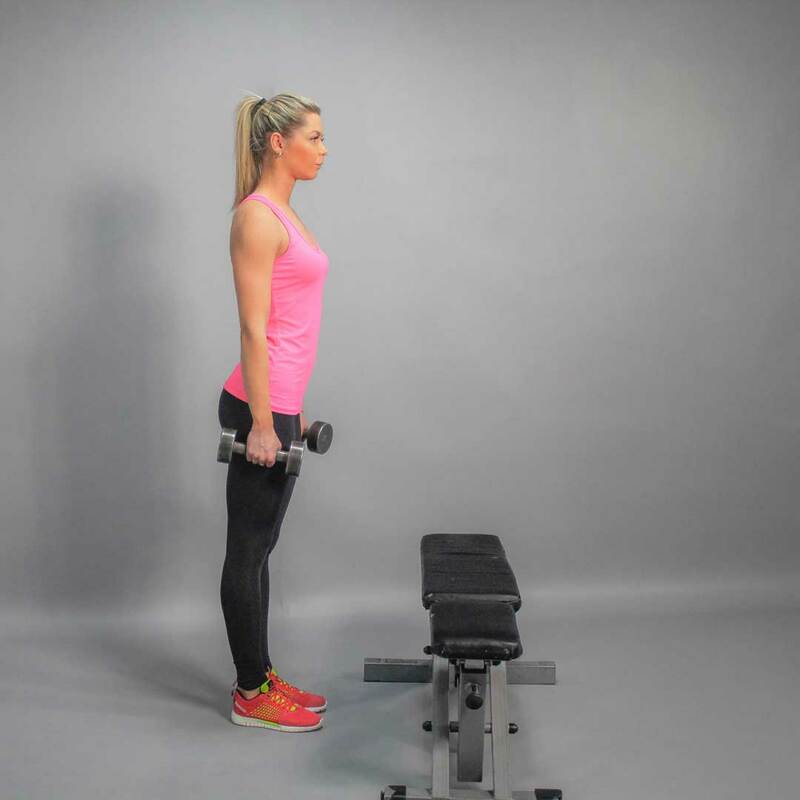 Stand in front of the bench or platform at a distance of about 6–12 inches. Knees are slightly bent and feet are placed approximately shoulder-width apart. Squeeze your abs and slightly arch your lower back. This is your starting position. Grab a pair of dumbbells and hold them down at your sides. Inhale and move gravity center to right leg. Step up with the left (working) foot on the platform. Tense hip muscles of working leg. The entire foot of the working leg rests against the bench. You should push off with your right foot and place it next to left foot on the platform. Only then you can exhale. Again inhale and step back (on the floor) with your right foot, resting left one on the platform. This is the end of one repetition. At first, perform all repetitions of the set with one leg, and only then move on to the other. Or you can alternate legs during the set. Keep torso upright during overall set. Therefore, during the movement flex your abs (but don’t tense it as you do so). However, it is not recommended to relax your lower back, as it keeps the natural curvature of the lower back. When performing the exercise, keep your eyes facing forward. You can only glance at the platform when stepping up on it. Pause to recover the balance prior to moving up and down on the platform. Don’t practice fast stepping up and down! It’s not safe. Learn how to do the exercise flawlessly, and then you can increase working weight. For this reason, you should use only lightweight dumbbells when practice step ups.